Athletic footwear, or more commonly known as the sneaker, have been around, officially, for well over 100 years now. While its ‘invention’ itself may have been a mark of importance on providing a comfortable, everyday shoe to the population, it wasn’t until after World War II that it became a more popular option than regular shoes. This not only spawned quite a number of different brands, it also introduced new technologies to your footwear, with manufacturers spending more money on research and development to get ahead. There are quite a number of sneaker brands today, more so than any time in its history. They’ve become so popular of late, that even major fashion houses have thrown they weight behind a few partnerships, with some even going so far as to create their own sneakers, although, truth be told, it may have been better to leave it to the experts instead. While the number of sneaker houses continue to grow, most of the sneaker technologies that have changed the market have come from a handful of companies, including ASICS, adidas, Nike and Reebok. We take a quite look back at the major changes each of these giants brought to the market at various stages in different eras. One of the earliest new materials that changed the industry was the release of the mesh. Not only did this allow sneakers to become a lot more lightweight, the material was also breathable, two very important characteristics for the new age of sneakers. One the earliest sneakers to be credited with the inclusion of the newly developed mesh was the adidas Americana in 1971. The Americana was available in both high and lowtop variants, which featured the red, white and blue colourway. The sneaker was the unofficial shoe of the ABA, to which it also bears the ABA ball. If you grew up in the same era of sneaker as myself, you’ll no doubt would have lived through the hype of the Nike Airs, which was seen as the “it” sneaker of the early 90s amongst kids. In fact, the Airs were already a loved sneaker amongst sneakerheads well before that, and once again when Nike relaunched the Air Max a few years ago. But, while many would credit the Nike Air Max I (1987 designed by Tinker Hatfield) as the sneaker that brought us the cushioning technology, it was only the first sneaker to make it visible, which brought about the hype around the sneaker. The first Nike to include the Air cushioning was the Nike Air Tailwind running shoe released in 1979. The Air system allowed users to, literally, walk on air, with a plastic chamber inside the shoes midsole. The ‘window’ in the technology, however, remains the most popular Nike sneaker for the era, and the most known cushioning tech still to this day. As with many sneaker companies, ASICS has a really intriguing history. But we’ll leave that history for another, more featured article on the subject. Although unassuming to most, ASICS played an important role in modern footwear with its invention of the αGEL. The material was designed to be able to absorb the impact of each tread from the foot, taking most of the shock. This was in contrast to Nike’s Air cushioning, and it quickly became the go-to jogging shoe for many athletes. The company still enjoys the rewards of dominating this space in the late 80s, and throughout the 90s. The first shoe to fit the αGEL material was the FREAKSα (by Shigeyuki Mitsui), released in Japan, which was then rebranded for the international market as the GT-II. To celebrate the 30-year anniversary of the sneaker tech in 2016, ASICS Tiger launched the Gel 30th Anniversary Commemorative Model “GEL-LYTE Ⅲ, GEL-LYTE V, GT-COOL XPRESS”. It may never have enjoyed the glory and fame of the Nike Air, but it has been hailed by athletes across the globe as one of the most important developments for runners, and still enjoys a loyal fanbase. 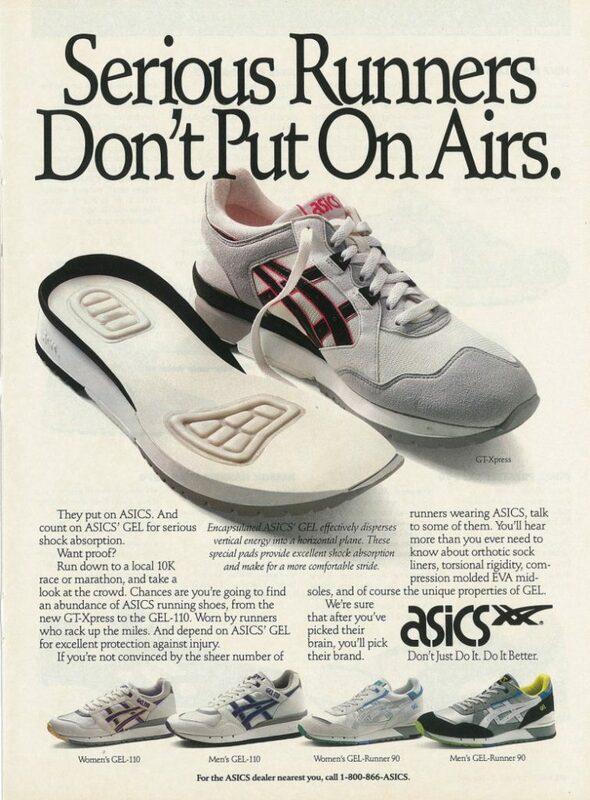 I do love some of the ASICS ads from the late 80s, taking on the giant in the industry, Nike. Nike were on a role in the 80s, taking over quite a substantial chunk of the market, both in athletics and everyday sneakers. Designer, Tinker Hatfield, already featured prominently with the development of the Air Max I, but in the same year also was credited for the Cross-Trainer, a concept footwear that allows for multi-purpose use, not only in various sports, but also as a daily runner. There’s also an interesting story behind the original Nike Air Trainer 1, the first Cross-Trainer, which almost never saw the light of day were it not for the antics and insubordination of John McEnroe. The shoe was designed for running, basketball, tennis, and many more activities, and was included, accidently, in a box of shoes sent to McEnroe to try out, when he had directly asked Nike to come up with something different, after being annoyed with the state of shoes at the time – so was his influence and clout at the time. After Nike requested he keeps all project shoes under wraps, he disregarded their instructions and laced them up to some of the biggest tennis tournaments in 1986. 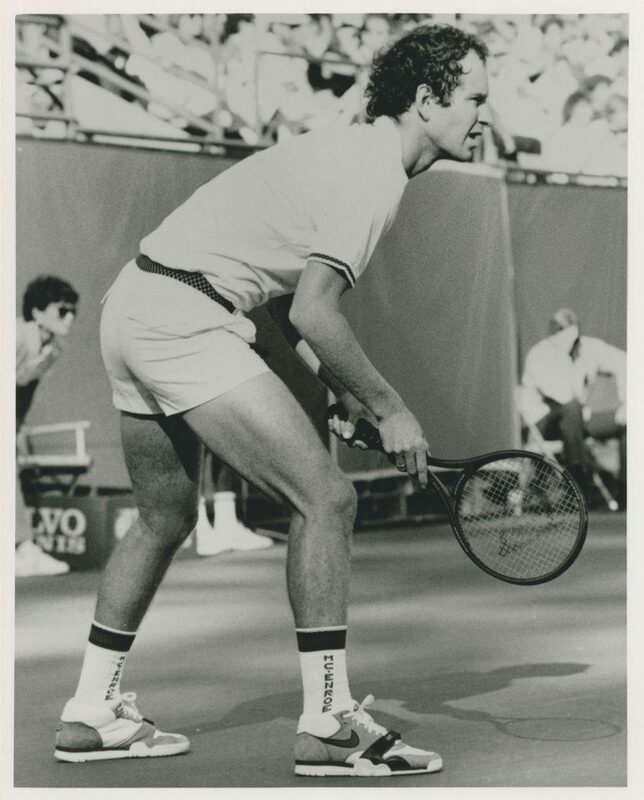 In fact, McEnroe is credited with bringing the shoe to life, as the prototype was never intended to be sent to him for ‘review’, and most likely would have ended up in the list of unreleased prototypes. Reebok may never have been as huge as some of the leading brands, but still enjoy a rich history, both in terms of athletic equipment and street gear. Some of my favourite running shoes were developed by Reebok, e.g. the Zig with its ZigTech technology. However, it was their Pump technology released in 1990 that earned Reebok a spot on this list. This was the era when comfort and cushioning were big for both runners and sneakerheads, as we’ve already seen with Nike Air and ASICS Gel. The Pump was a “custom fit” technology that allows users to inflate the air bladder of the shoe to their own liking and preference, with Reebok introducing it to the market in various forms over the years. 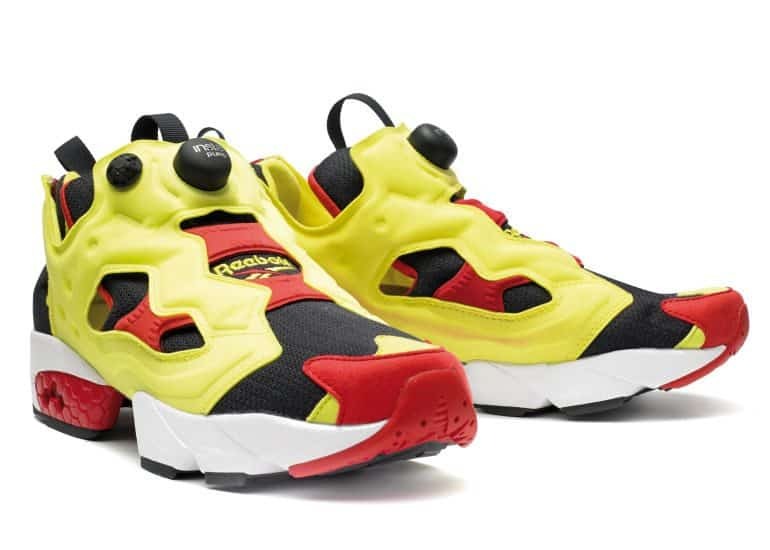 The Reebok Insta Pump Fury was the very first shoe I ever remember wanting as a kid. Unfortunately, not only was it not available in many parts of South Africa, it was pricey as well – certainly not something any parents would buy their 10-year old kid. The shoe also featured some of the craziest colourways for its time. After the rich period in sneaker history of the late 80s and early 90s, there weren’t many major develops for quite a long period of time after this era. In fact, the late 90s and early 2000s wasn’t the greatest period for sneakers. In 2011, however, adidas, after many years and money spent on research and development, launched the fully synthetic adidas adiZero Crazylight, the first, fully synthetic shoe. It may seem like an obvious stepping stone now, but until it was released, it wasn’t fully feasible. The synthetic, plastic-based materials allowed for a significant reduction in weight when compared to leather, while also providing greater durability with a supportive canvas or nylon. These became the industry standard for basketball shoes since, now used in all the top models across different brands. It may not have added a lot in terms of advancements in the sneaker industry, often reserved for significant improvements in weight, comfort and the likes, but the knitted material has definitely changed the face of the sneaker industry in terms of design. In late 2011, Nike announced their Flyknit material to the world, and was officially launched on the Nike Lunar Flyknit Trainer HTM in February 2012, alongside the Flyknit Racer. The original HTM sneaker has since become a ‘small’ collector’s item among fans due to the limited release when launched. Some of these can be seen on sale for over $1,000, with a few originals (released at Nike Sportswear 21 Mercer) even stretching beyond the $10,000 mark. Released in 2013, the Boost technology still features heavily on the scene, and has gone a long way in providing additional comfort while remaining super lightweight. First released on the adidas EnergyBOOST Glow Zone M, the Boost Foam has become synonymous with the company. The new technology, however, wasn’t created by adidas themselves, but rather came about through a partnership with the largest chemical company in the world, Germany’s Badische Anilin & Soda-Fabrik (BASF) and bore its original name Infinergy. The Boost Foam, actually a branded name for thermoplastic polyurethane, is available exclusively to adidas as a result of this partnership with the company. This foam offers revolutionary cushioning, which includes small, individual capsules of a proprietary foam that are blow-molded together that, unlike other foams on the market, do not break down over time and maintains its responsiveness, while also not susceptible to hot or cold conditions, which can affect the feel of other types of foam cushioning. adidas have added the technology to popular models like the Ultra Boost or YEEZY collection, as well as old school styles including the Superstar, Stan Smith, and EQT series in modern reimaginations of those sneakers. It is worth mentioning that these are a list of the most influential tech invented for sneakers throughout its history, and not the sneakers themselves. As such, the likes of Converse All-Stars and the Puma Clyde or the Jordan do not feature here, although they remain some of the most important sneakers released. We’ll cover that in a follow-up post.